Danvers Blickensderfer really loves Gonzo. He has a Gonzo t-shirt for 6 days of the week! Seriously you can’t honor Gonzo every day. Danvers is a typical 6th grader trying to produce Gonzo style stunts for the pleasure of his friends and class-mates and trying to survive the torture of sharing a room with his evil toddler sister Chloe. Everything changes for Danvers when in the middle of the night he is transformed from a regular kid into a Muppet. Danvers balances trying to reverse his condition (under the careful medical eye of Doctor Bob and other favorite Muppets) and balancing the fame that an internship as Gonzo’s assistant with the Muppets and his transformation (seriously he is a Muppet) brings him. Will Danvers be normal again? Will his friend and safety coordinator Pasquale be lost in Danvers’ sudden fame? Will Danvers and his Muppet boy band Mon Swoon outplay the boy band Emo Shun lead by Danvers’s former best friend! The 6th grade is tough! Kirk Scroggs authors and illustrates this story in Tales of a Sixth-Grade Muppet. Scroggs alternates telling the story between narrative text and cartoons that blend together into one story. The images are humorous and light. And the text is easy to read, I read the entire book in a little more than an hour, two train rides and a little lunch time! It took the Between Tween a few days of off and on reading. The story itself reminds me of Diary of a Wimpy Kid as represented in the movie with the text itself being what I imagine reading the book would feel like, the Between Tween says there are more pictures in that series. I found the story to be safe and did not cause me much excitement. It was amusing but probably not anything I would ever seek out. I did enjoy seeing and reading the Muppets in book form. And as a Disney fan I chuckled at references to Mary Poppins and Buzz Lightyear. But I am pretty sure for the author and publisher that adults who enjoy the book are bonus fans and not the target audience they are trying to capture. I am not fully qualified, by age, to provide a fair review to this book. So I went to the Between Tween for the official Between Disney take! The Disney Tween states that the book is really really funny. The Tween’s favorite character was Pepe (who throughout the book has to fight the impression he is a shrimp). The Tween has seen a lot of Muppet movies in the past but thought Tales of a Sixth-Grade Muppet as a wow. The Tween thought the pictures were really detailed with the favorite picture sequence being the toothpaste commercial. The Tween thought the message of the book was to stick with your friends no matter what, which does not sound like a bad message to me. The Between Tween would reread the book. Overall the Tween, the real target audience, gives Tales of a Sixth-Grade Muppet a thumbs up and would recommend it. 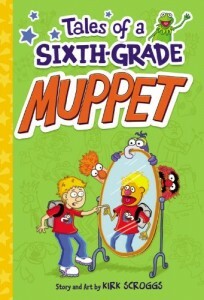 Adults, Tales of a Sixth-Grade Muppet may not be for you. It may provide you some amusement but it’s likely not the sort of book a more mature audience will enjoy. But, if you have a seven to twelve year old in your life this book would likely make a great gift! Seriously, didn’t most of us dream of being a Muppet as a kid, and this book will just help feed that desire in your kids. One of my favorite stories in Jack Lindquist’s In Service to the Mouse is set in Betweenland. Lindquist was flying across Texas one day and realized that he could see circles created by natural gas fields at 35,000 feet. His mind then jumped to the ability to see a famous three circled profile from a plane. As he considered the idea, he realized that a Mickey Mouse that could be seen from airplanes would be a good idea for Mickey’s 60th birthday in 1988. 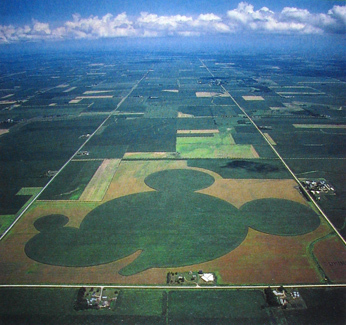 After a vast amount of research it was determined that an Iowa cornfield would provide the best color contrasts to see Mickey Mouse from the air. Lindquist’s staff contacted Iowa State University (or should we say Between University) and selected together the farm of the Pitzenberger family of Sheffield, Iowa. In a turn of irony, the Pitzenberger family rented the 3,000 acres from a gentleman named Walt! The small town embraced the idea of the Mickey Mouse birthday card and used it as an event to promote their small town of 1,224 (Lindquist, 183-4). Magical rain was the key to growing Mickey Mouse in Iowa. The summer of 1988 was a drought for Iowa. Yet, the rain came to Sheffield and the crops grew and Mickey Mouse, the crop circle, took shape on a Betweenland field (Lindquist, 185). The design consists of 6.5 million corn plants surrounded by 300 acres of oats, and its 1.1 miles from the tip of Mickey’s nose to the end of his ear, said Disneyland spokeswoman LouAnne Cappiello (“Iowans help Mickey Mouse Celebrate”). As they say in Field of Dreams, If you build it they will come. And come they did. For the official opening Disney put on a Birthday party in Iowa. Mickey, Minnie, Donald and Goofy all attended and met with guests. Earforce One, a Mickey shaped hot-air balloon, soared in the Iowa sky. Around 15,000 people came to celebrate Mickey’s birthday. On the following weekends Iowans visited Sheffield to see Mickey’s profile from miles around. The publicity went beyond Iowa as the cornfield was covered by major media outlets. And overflying airlines alerted passengers to the hidden Mickey outside the airplane (Lindquist, 185). Sometimes we dream of Disney, trying to think of ways to reconnect when we live far away from Orlando and Anaheim. Sometimes we need to remember that the mouse sometimes comes to us! Goofy Gadgets - Fix-It Felix Jr. If there is one trailer that the Between Kids cannot stop watching it is Wreck-It Ralph. The trailer shows a very Disney like storyline, the discovery of self, in a very un-princess world. Ralph may be a bad guy, as they say, but he does not appear to be a bad guy! The Between Kids take notice every time this trailer pops up and was their favorite of the pre-Brave trailers. So the enthusiasm is there with key audience demographics. And they love seeing images of characters from worlds like Super-Mario and gobble up news about appearances by characters like Sonic the Hedgehog. For me I am looking forward to finding out how Disney will handle a large number of non-Disney characters. So enthusiasm is high, but that momentum can be lost! I was more excited for Brave a year before I saw the movie than I was the day I saw it. I do not know if it was the marketing campaign, my own desire to stay away from spoilers or John Carter fatigue (I have spent so much time defending it), but I was finding myself unexcited about Brave as I entered the theater. Maybe Disney has become wise to the fact they need to keep those likely to see their films excited about them in the long months before the release and are looking to new ways to keep that enthusiasm stoked. One way they are attempting to keep us excited for Wreck-It Ralph is a new app for iOS devices like iPods and iPads called Fix-It Felix Jr. which ties directly into the November movie putting the characters of Ralph and Felix directly into the hands of the future audience. The game itself uses images we see in the trailer. Ralph climbs to the top of the screen which has a background that appears to be an apartment building. He then begins to wreck the building by dropping bricks. 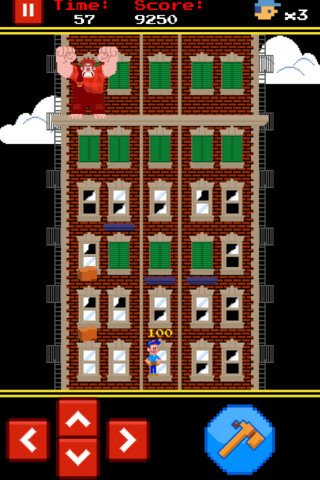 You control Fix-It Felix Jr. as he scurries around the screen fixing the broken windows, doors and shutters on the building. After everything is fixed Ralph climbs higher and you begin again. There are obstacles to slow Felix such as ducks, the falling bricks and partitions which limit Felix’s movement. These obstacles are added as levels increase. Additionally players can pick-up items like additional life or time. Scene from Fix-It Felix Jr.
First, I really like the idea of marketing the movie by offering a game, and a free game at that. I think the idea is brilliant. Second, when I initially played I enjoyed the game and made it to level 4 after a few plays. Third, the Between Tween really enjoyed playing and wanted to beat my high score. Finally it really does have the 8 bit feel of Donkey Kong or Mousetrap from my childhood and I love the trip back into memory lane. But with all that said I do question the replay value, as it seems to repeat the same goal over and over again. Fix-It Felix Jr. is no Where’s My Water ? with its growing number of levels and variety. And I never saw from the trailer the residents of the building throwing Ralph over. I’m sorry Wreck-It Ralph but I really wanted to see you thrown off the roof. 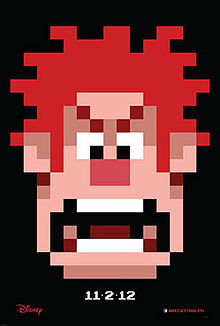 If you want a piece of Wreck-It Ralph now, Fix-It Felix Jr. may satisfy your craving temporarily. The game may not hold you until November, but with a cost of free you can’t go wrong enjoying at the least a few game play sessions. For the Between Family ABC’s Once Upon a Time has become event television in the age of the DVR. It is the only one show that we watch as near to live as possible (we attempt to start it late enough that we can still fast forward through commercials but end with the live audience). We just cannot get enough. At the San Diego Comic Con, ABC released this teaser for Season 2. Personally all this news makes me very excited. The role of Belle makes me wonder if we will see a kinder gentler Rumplestiltskin or will he be out for revenge since the Evil Queen took his love away from him. Will we see more Mad Hatter, a character whose grayness fascinates me? Could Tinkerbell and Peter Pan be far behind this initial casting news? Will the identity of the Red Queen from Wonderland be revealed? Here are two things I am willing to make solid bets on. First, magic will complicate Storybrooke. Our characters have been away from magic and their former lives for a long enough gap that the magic will lead to struggles between old and new identities and relationships. Second, I am pretty confident that the flashback scenes will feature how Snow White and Prince Charming took the kingdom from the king, which did not result in the king’s death since he is present in Storybrooke! Of course that is another complicating matter as the king and those that overthrew him are living in the same small Maine community. I don’t know about you, but I am very excited that season two is just a few months away and that season one will be released on Blu-Ray and DVD on August 28th. 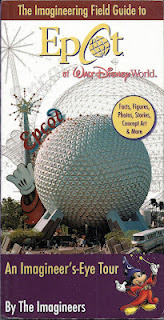 This volume follows the same pattern of the other Imagineering Field Guides, and as such readers of other volumes will feel very comfortable with the Epcot edition. I originally read this volume not because of a future trip as I had with other Imagineering Field Guides. Instead, I picked the The Imagineering Field Guide to Epcot at Walt Disney World up to help me connect to Epcot out here Between Disney. The photos, art and insider information about the park I just visited succeeded in helping me to remember the trip I had returned from and fuel my desire for a future trip. Regardless of which Imagineering Field guide you chose; The Magic Kingdom, Epcot, Animal Kingdom, Disney Hollywood Studios or Disneyland they all are great tools for learning more about the Disney parks and reconnecting with your favorite magical moments. 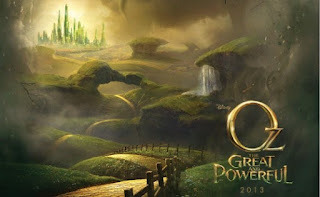 Disney at the 2012 San Diego Comic-Con has released the first Trailer for Oz The Great and Powerful. What do you think? Does Disney have another franchise smash in the mold of Pirates? Personally, I have been somewhat apprehensive. I really enjoyed Sam Raimi's Spider-Man, but had lost excitement by the third installment in the franchise. And James Franco has not been a favorite for me, but then I have not disliked him either. It has a real Alice in Wonderland feel to me in some scenes, with a pinch of John Carter. Almost anyone with a television in the world is aware of some of the entertainment contributions of one founder of the Walt Disney Company, Walt Disney, but often it is forgotten that the company began in 1923 as the Disney Brothers Studio. Often forgotten is the legacy of the older brother in the Disney partnership, Roy O. Disney. When I originally read Bob Thomas’ Walt Disney: An American Original I was struck by the loyalty that Roy O. Disney showed his brother and the essential though often invisible role he played in the success of Walt Disney by overseeing the business side of Disney endeavors. 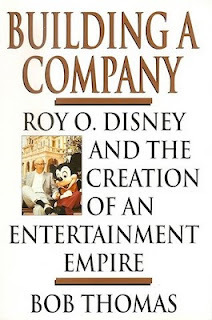 This lead me to seek out more on the life of Roy O. Disney and the first and most prominent source I reached for was a lesser know book by Thomas, Building a Company: Roy O. Disney and the Creation of An Entertainment Empire. Thomas outlines Roy O. Disney’s life from birth on June 24, 1893 to his death on December 20, 1971. As a youth he developed a strong relationship with his much younger brother Walter. The two boys often worked and played together despite a sizable age difference. Disney left his job as a bank teller to serve in the U.S. Navy during World War I. Having acquired tuberculosis during his naval service, Disney relocated to a veteran’s hospital in the Los Angeles area. His brother Walt followed soon after his Kansas City cartoon studio became bankrupt. Walt asked for Roy’s assistance and the next morning Roy checked out of the hospital never to return for his wartime affliction. Forming a partnership called the Disney Brothers Studio, Walt oversaw the creative endeavors while Roy guided their business interests and occasionally operated a camera. Over the next 50 years Roy oversaw the growth of the Walt Disney Company, his suggestion for a name change, that transitioned from cartoon shorts to animated features, live-action movies, television programs and two theme parks. During all of these projects Thomas makes it clear that Roy O. Disney dutifully supported the dreams of Walt Disney, though not always in agreement, and acquired the resources and funding needed to make Walt Disney’s ideas come alive. I really found this book a delight and helped fill my need to know more about this great man and co-founder of the Walt Disney Company. Thomas does an excellent job of introducing us to Roy O. Disney the man. We get the picture a loyal man who followed his younger brother into a questionable future based on his faith in that brother’s ability. Roy O. Disney was also the man who finished Walt Disney’s dream of Walt Disney World, admittedly not as ambitious as Walt may have dreamed but one that was still made available for public enjoyment. It is the picture of the Walt and Roy O. Disney relationship that captures my imagination the most. The two men were in many ways different yet thoroughly attached to each other. And we see Roy O. Disney as the quieter brother, coming home after work for time with his wife and son while Walt was the public face of the company and in the eye of the fans. Especially gripping for me is the retelling of Roy O. Disney’s last visit with his dying brother as Walt dreamed one last time with his older brother. Along with Roy O. Disney the brother we also get a picture of the business man. Roy O. Disney was very personal in his interactions with associates. For example his trips to Europe included his wife Edna, who would entertain the wife’s of Disney staff members and contacts abroad. He was a man who put a personal touch on a growing company. And these personal relationships greatly benefited the company’s bottom line as it expanded into new markets. Additionally in the personal area we see his interactions with his family including his long relationship with Edna and his love for his son Roy E. Disney. It would be easy to write a book about the business choices of Roy O. Disney from founding a start-up to evolving into a publicly traded company. But instead Thomas does an excellent job of showing Roy O. Disney the man. Thomas yet again provides solid readable writing that Betweenlanders will enjoy. Additionally as a historian his book is very well researched including interviews with prominent Disney personalities and legends and use of documents found in the Disney Archives, including Roy O. Disney’s personal and business correspondence. Building a Company is the most extensive profile of Roy O. Disney available to the public. As someone who has become a fan of Roy O. Disney’s life and legacy I highly recommend this book for all Between Book libraries. Were Betweenlanders ready for Mickey Mouse’s cousin Spider-Man in this summer’s The Amazing Spider-Man released on July 3rd? Wait a Spider-Man movie? There does not seem to be any tweets, blog posts, Facebook status updates or covers of D23 magazine to support this effort from Disney. Why wasn’t Marvel’s most prominent hero not in The Avengers? Clearly that had to be a mistake on Disney and Marvel’s part. Well, I bet Disney would love to be promoting a Spider-Man movie, maybe even including him amongst the Avengers. But they can’t do it. Sure they can put Ultimate Spider-Man on the small screen to promote The Avengers but Disney does not have the rights to produce big screen Spider-Man projects. Those rights are currently owned by Sony and The Amazing Spider-Man is distributed by Columbia Pictures and not Disney. But I bet that Disney would love to get those rights, along with the rights for Spider-Man to appear in an Orlando area theme park, rights currently in the hands of Universal Orlando. Despite the lack of press from Disney on this film, despite a Disney Store email I received letting me know they had Spider-Man gear, the new film seems to be doing okay. And when I say okay, I mean the highest premiering film on a Tuesday in movie history. Yes, the all important Tuesday! This isn't the Magic Kingdom! In 2002 it felt like there had not been a superhero movie for decades. Okay, there had been but sometimes perception is reality. So that summer’s release of Spider-Man staring Toby Maguire as Peter Parker/Spider-Man telling the origins of the webbed one on the big screen was an event. Overall I enjoyed the movie back in 2002 and thought it well done. Now with The Avengers in the rear view mirror it seems less exciting and less like the event it was ten years ago. Yes, it lead to a Spider-Man trilogy but when originally viewing it I just did not get the sense that was going to lead to something bigger like I did with Iron Man. With Spider-Man being popular in the Between House right now, our pretend play trunk has recently seen a full costume added to it, it was time to dust off the DVD (yeah DVD) and watch this surprisingly Mousey Movie together. · Dead Man’s Party: All you have to see is music by Danny Elfman to setup a Mousey experience. I was introduced to the front man of Oingo Boingo in 1989 with his brilliant collaboration with former Disney animator Tim Burton in Batman. As I think about it maybe I should include this non-Disney hero’s tent pole film as a Mousey movie because it is loaded with Disney connections too. But to come back to the point. Burton and Elfman have worked together numerous times since including Disney’s 2010 Alice in Wonderland which earned a box office of over 1 Billion dollars, yeah capital B. 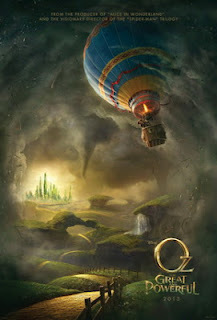 But his work has not been limited to Burton films and other Disney collaborations include Flubber, personal favorite Meet the Robinsons, Burton’s Frankenweenie to be released this year and next year’s Oz, The Great and Powerful. · Warrior King: Willem Dafoe plays villain Norman Osborn or the Green Goblin. Dafoe brings a good amount of crazy to the role. His eyes yell, “Hello, I am psychotic!” For Disney Dafoe would play green again. In 2012’s underrated John Carter he nailed the role of Thark, green Martian, Jeddak Tars Tarkas. Yes I know his costume is CGI, but in the same way his eyes communicate crazy in Spider-Man his voice and captured motions scream nobility in John Carter. · The 13th Floor: A few years ago I made a mistake. Hoping to encourage one of my kids to ride The Twilight Zone Tower of Terror I rented 1997’s Tower of Terror starring Police Academy’s Steve Guttenberg. I remembered the film as harmless and helping to provide a back story for a ride that I had only ridden only to a child scared off by the word terror. Well, for a kid Tower of Terror can be well, TERRIFYING. So note Betweenlanders Tower of Terror is not going to get a skittish kiddo to ride the elevator to the 13th floor. Now for us a five dollar bribe from a friend eventually did the trick and now I can’t get this same kid to quit ridding The Twilight Zone Tower of Terror. Kirsten Dunst who plays Parker’s love interest Mary Jane Watson also plays Guttenberg’s young nice Anna in this made for TV movie and serves as the character in Tower of Terror that kids can most indentify with. · Hero Maker: I love it when the Between Kids find Stan Lee in a movie. Yes true believers, Stan Lee has a cameo in this movie profiling his most prominent creation. And I look forward to playing Where’s Waldo with Lee this summer in The Amazing Spider-Man. I have heard the cameo is fantastic. 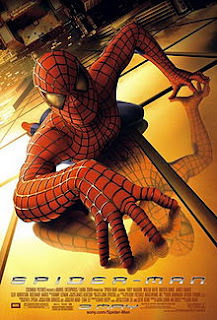 · Coming Attractions: Sam Raimi directs this 2002 Spider-Man flick. Now he has stepped away from the Spider-Man franchise for other things. These include 2013’s Disney feature Oz: The Great and Powerful, which tells the origin of the Wizard of Oz starring James Franco who plays Harry Osborn in Spider-Man. I enjoyed my afternoon reliving Spider-Man with first time viewers, especially ones so into Spider-Man at the moment. The movie may not be on the scale of The Avengers but they do share the background of New York and you definitely feel as if you are in the same universe though Nick Fury won’t be stepping into any scenes. If you don’t feel like you can take the entire family to this summer’s The Amazing Spider-Man while it’s in theaters Spider-Man is a good candidate for a family movie night. 500 entries and Dole Whip has to share! Chris Strodder has updated The Disneyland Encyclopedia: The Unofficial, Unauthorized, and Unprecedented History of Every Land, Attraction, Restaurant, Shop and Major Event in the Magic Kingdom. True to its title The Disneyland Encyclopedia documents the smallest snack cart, the shortest lived shows, the favorite restaurants and the beloved attractions inside the Disneyland Park from its 1955 opening. Starting with A and finishing with Z, Strodder documents the park in a methodical manner. Yes, Dole Whip does not get its own entry, but Dole Whip is not a restaurant or show, though some may argue it is an attraction. Strodder still reports the success of the cult food in the Tiki Juice Bar entry as the restaurant fits the plan of the book where a snack would not. 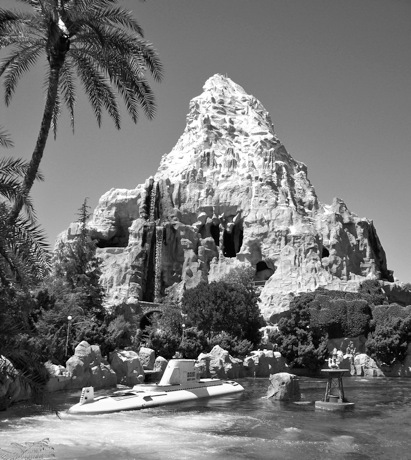 It would be difficult to find any physical element of Disneyland that is not documented in the book’s entries. There are two ways to read this book. 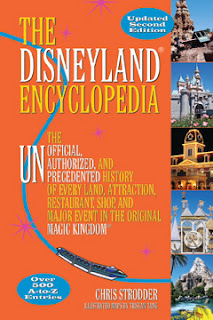 First, one can read The Disneyland Encyclopedia straight through as an organized history of the park. And through this method, which I did complete in a week, one can add much to their understanding of the park. For example, I knew from Mouse Tales of deaths in the park but I had not considered the more obvious life event, births. And I was not aware that the baby picture in the Baby Care Center was Walt Disney! The reader does get the sense through the entries of the ever changing Disneyland, be it an attraction that was open for a few weeks or be it for decades. Strodder’sd writing makes it clear that the park is living and evolving. The entries are well written and clear which aids the reader looking to explore the book A to Z. But I am kind of a strange guy, for goodness sake I have read an almanac cover to cover this year, and this method may not be preferred by everyone. Not many will chose to read The Disneyland Encyclopedia in a week. And with over 450 pages of entries it is a lot of information to read through quickly. The second way to use this book is as a research tool. 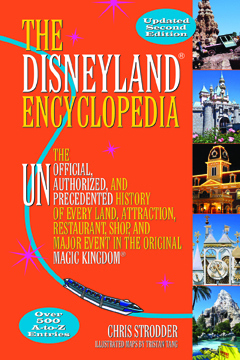 The Disneyland Encyclopedia can provide a basic background on all attractions, shows and restaurants. 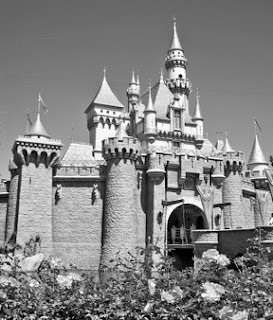 Honestly it is a must have resource for anyone looking to research Disneyland. As a research tool the book also includes an extensive bibliography which will help keep me entertained for years to come. Additionally those who enjoy Disneyland and wish to know more about shops, rides or shows within Disneyland will likely enjoy thumbing through this text. If someone likes to flip through touring books, it is enjoyable browsing through The Disneyland Encyclopedia in the same way. It can serve as a supplement to vacation planning. Chris Strodder’s The Disneyland Encyclopedia is a resource which Disneyland fans will likely enjoy and find informational. The readable text along with over 400 black and white photos and sidebars can help one forget you are reading an “Encyclopedia” at times. After reading the second edition of The Disneyland Encyclopedia I can see why I have heard podcasters refer to the first edition as an invaluable research tool. If anything, a read-through makes me wish there was a tool available that was as exhaustive for other portions of the Disneyland and Walt Disney World Resorts.